Dear Readers, I have noticed that the suet pellets and worms and ‘birdy granola’ that I’ve been putting into the ground feeder has been completely demolished every single evening. Someone has been eating the stuff with a thoroughness that no beaked creature could possibly manage. I even had a suspicion that it had all been licked clean. I was blaming the local cats, but then I noticed this handsome creature, munching through it in a leisurely fashion in broad daylight. When foxes are seen during the day it’s often an indication that they aren’t very well, and so are having to take more risks in order to get food. This one has a poorly left front paw. When I saw him for the first time ten days ago he could barely put any weight on it at all, but by later this week it seemed to be a little better. Foxes are very prone to spraining their limbs, and if this is the fox that I’ve disturbed in the garden on previous occasions, he thinks nothing of jumping six feet onto the shed roof and making his getaway. The leg looks ‘normal’ to me (i.e. nothing is at a strange angle) so I’m hopeful that he will soon be completely fighting fit again. He seems otherwise in very good condition, with no sign of mange or injuries. Foxes are such exquisite-looking animals that I always feel privileged to see them in the garden. This one hoppity-hopped down to the pond for a drink, watched the frogs with some interest and then investigated under the wooden steps. I’m sure that there are all manner of small creatures lurking under there, and I half expected him to pop up with a wood mouse in his jaws, but all was well for the rodents. Foxes are true omnivores: the local ones seem to have a special fondness for Kentucky Fried Chicken. As the KFC is at the end of the road, the foxes seem to enjoy carrying the chip packets and chicken-wrappings that they find into the side return, leaving them for me to find in the morning. As I think that KFC is an abomination this is a particular trial. But the foxes will also eat anything from bulbs to earthworms, rodents to small birds, and, of course, bird food. I was also holding them responsible for the great frog massacre of a few years ago, but maybe I am wrong on that count. At any rate, this fox seemed to realise that the frogs were not particularly edible, and left them to it. And so the fox wandered off, through the hedge, past the shed, behind the seating area at the back of the garden and off. I hope that his paw continues to improve, and I wonder if he is provisioning for a vixen holed up somewhere and already pregnant? Suet pellets are expensive, but they’re cheap if they attract animals as handsome and interesting as this. 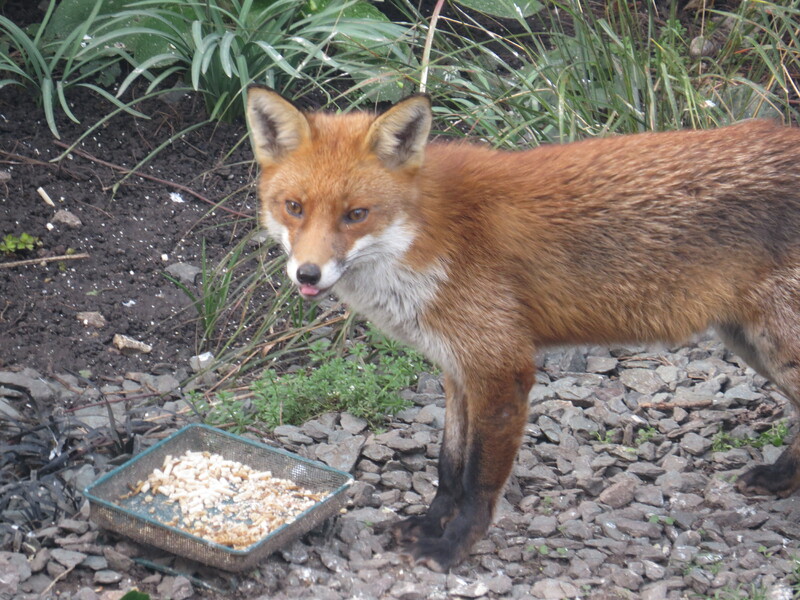 Maybe I’ll start putting down a tiny bit of dog food, just so the fox has something species-appropriate to munch. I have a feeling, though, that all he’ll do is eat the suet and the dog food. Does anyone else feed their foxes? I don’t want to alter the animal’s natural behaviour (foxes that are too dependent on one food source, or too trusting of human beings, often come to a bad end) but I want to give him a little extra support while his damaged leg is recovering. All advice welcomed! This entry was posted in London Mammals on March 23, 2019 by Bug Woman. What a beautiful creature, he certainly looks in good shape even if he has a poorly foot. Our fox Ted (named after Edward Fox) comes to us every night about 10, we try and keep him to a meat protein diet but we must say as a treat he’s very partial to cooked sausages. As you say we are very lucky to share our gardens with such lovely and varied wildlife. We don’t do badly considering we’re in Zone 3 do we :-). We had a heron in the pond yesterday briefly. I was wondering where all the frogs had gone…. You are faced with a tough choice. I suppose, if the fox lets himself be close enough for you to photograph, as seems the case, he’s already somewhat accustomed to being in the proximity of humans. Probably, he also finds bird food and such at other homes. If he is to become damaged somehow by humans, it’s a process already begun, and you’ll do him no worst for putting out dog food. He’s bold and beautiful, his presence a gift, and I’d want to care for him, too. Nice blog! What a privilege! He is a handsome creature and I would not begrudge him any food either. No advice from me, our local foxes don’t come out until the early hours and then they are fast to move so I have not been able to interact with them. Oddly, they often enjoy jam sandwiches, and someone told me marmite sarnies are welcome too. In summer and autumn I’ve seen them eating low-growing blackberries, and blackberry pips can be spotted in their neat dark poo. Our cat’s poo is much more of a nuisance to remove from the garden. Yep, they love jam sandwiches for sure, though I suspect that they are creatures of varied and extensive tastes…. I can barely remember when well dressed ladies wore them. They are much prettier out in the wild. I do not know how much of a problem feeding the fox would be, so I should not comment on that; but I think I would give it dog food if it seems to be in a bad way, but not continue to give it more if he gets better. He’s a beautiful creature and I, too, would want to give him sustenance. Hope he continues to recover. He’s gorgeous and I definitely wouldn’t begrudge him raiding the bird food! I have absolutely no expertise to offer, but as others have suggested, he’s probably quite used to living off human food in one way or another and I’m sure any supplements to his diet will help him to get fighting fit again. No advice but what a lovely fellow he is! 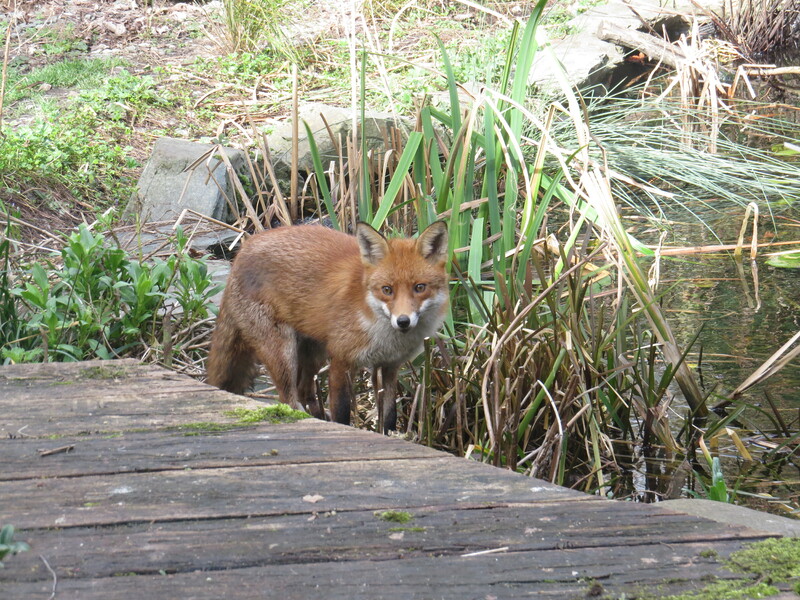 How special it is to have a fox visit your garden!